Chichen Itza is the site of an ancient Mayan city and also one of the New7Wonders of the World. Visit this UNESCO-listed site along with the city of Valladolid and a beautiful cenote on this excursion from the Mayan Riviera. 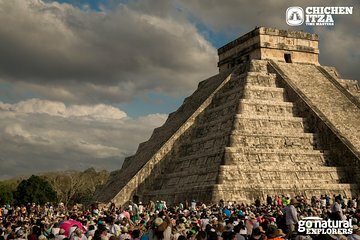 Learn about the ancient Mayan civilization, swim in the crystal clear waters of a cenote, and enjoy a delicious Mexican buffet throughout the day. El transporte está adaptado para sillas de ruedas; sin embargo, debe estar preparado para superficies irregulares en los sitios visitados, lo que puede ser difícil para personas con discapacidades para caminar o que usan una silla de ruedas.